With Summer just around the corner, we're here to reassure you that it will soon be over, so hang in there, and dressing head to toe in black will become an enjoyable experience once again. Fingers crossed! 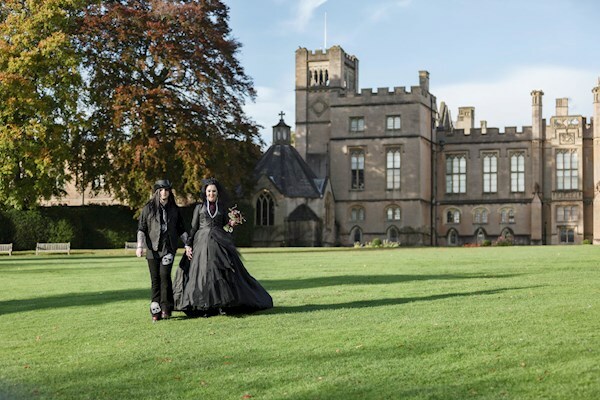 We'd like to take you back to last Halloween....well, actually Devil's Night, to be precise, to inspire you with a wedding full of gothy goodness and, by the sound of it, an excellent soundtrack! We are Emelie and Drew, currently live in Nottingham but originally from Sweden and Wrexham (North Wales; practically England) respectively. 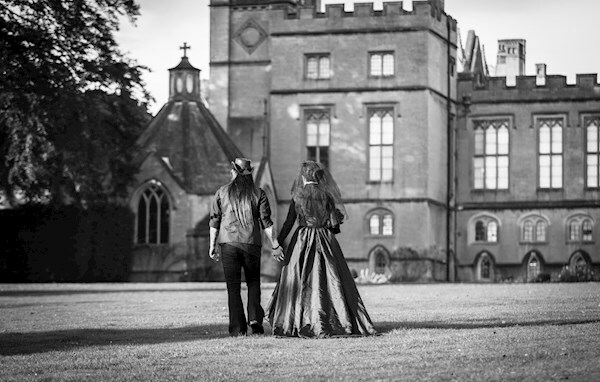 We got married on the 30th of October 2017 at Newstead Abbey in Nottinghamshire – Lord Byron's old digs. We probably have quite predictable interests, haha.. we do love our horror movies and horror music. Where we can, we go to gigs either in Nottingham or travel if there's a show we really want to see. This year we've been to Sheffield to see Michale Graves (ex-Misfits) and to Derby to see The Exploited. 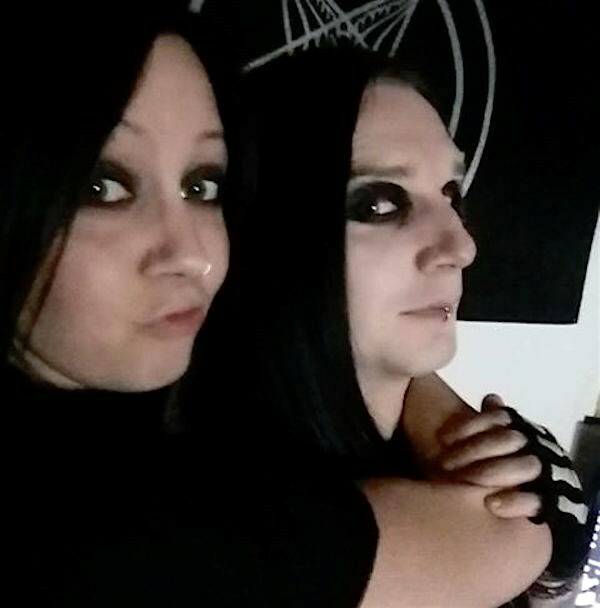 We both like metal music but Em does like her goth music too. Our home takes influence from the horror and gothic world too; we decorated our snake room in a Beetlejuice fashion for example... speaking of animals, we basically have a mini zoo going on. 1 turtle, 2 dogs, 1 rabbit, 3 spiders, 4 lizards and 14 snakes makes for a busy life outside of work! We've both been in bands before and even though no longer we have a music room and we dabble a bit and jam together when time permits. We try to do some travelling too when we have the time and money. We went to Whitby together in March 2017 which was a little pre-wedding trip. 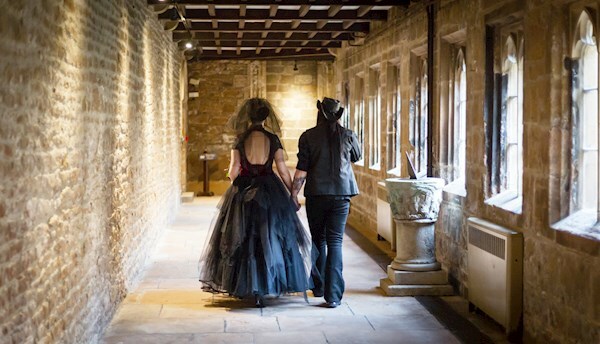 We saw all the sights and got a matching Count Dracula tattoo.. the plan is to go to Transylvania for a late honeymoon; possibly for our one year anniversary. We didn't have a theme as such, but the working date was Halloween, because..you know, it's Halloween. 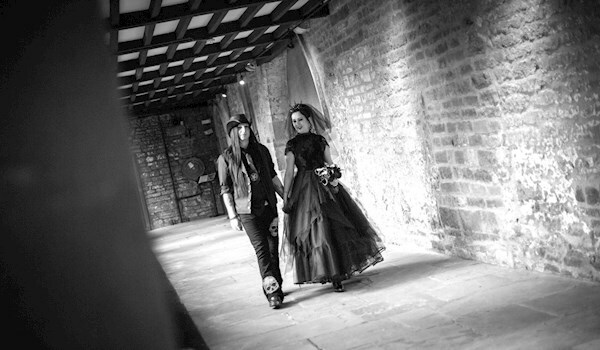 The reason we didn't settle for it is that we usually go to gigs on Halloween so didn't want to "share the date". The 30th of October became the date as we both do love the film "The Crow" and we thought why not go for Devil's Night? We did do the "Fire it up" chant with some friends on the wedding evening. Obviously it wasn't going to be a white wedding nor a church wedding, and we just wanted it as personalised as possible. We knew we didn't want many guests so we put more thought into the whole day. 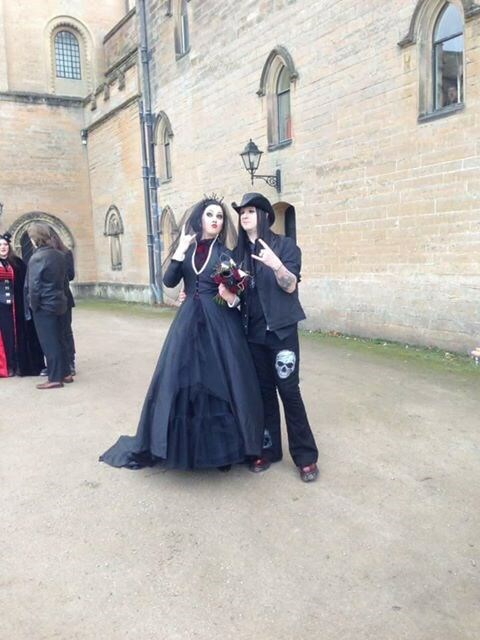 In the end, it ended up being quite a gothy affair. We walked down the aisle to Pachelbel's "Canon in D" which was perhaps an odd choice, but we both love it so it was a perfect choice. For the post-ceremony music (i.e. Signing the register, walking out) we actually had our violinist play the Jurassic Park theme as our first proper date was when we went to see Jurassic World in the cinema (despite the fact that we had already been together for months at that stage!) and the Death Arise Outro by Wednesday 13. Probably never heard on a violin before! We tried not to spend too much however in hindsight we probably did anyway! We didn't have any decorations in the ceremony room or welcome drinks room other than customised Order of Ceremony cards on each chair. Not at all conventional but more for fun. We also had a basket of venetian masks, and a "choose a seat not a side" sign at the door. For the dinner, we set the tables with black tablecloths and just put one large black lantern in the middle. Each table had a name and we crafted name tags ourselves and attached to the lanterns. 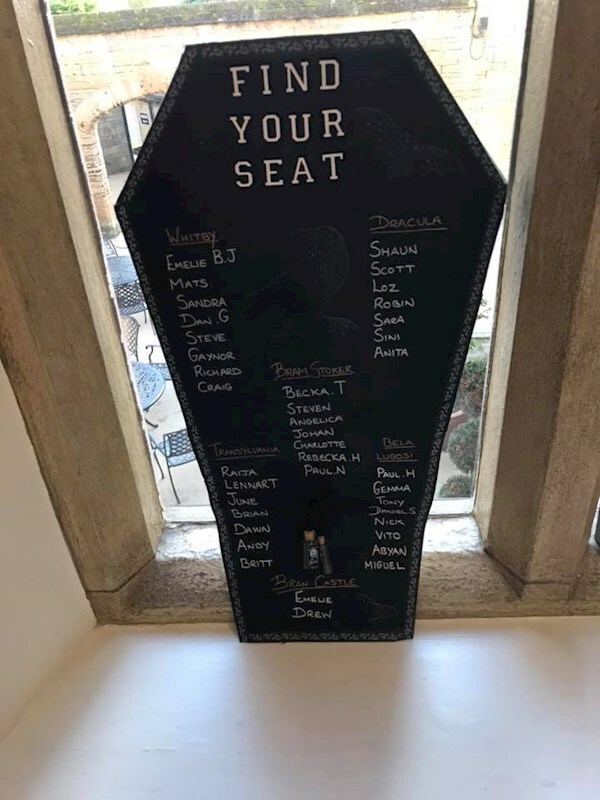 The seating plan was also crafted in an evening; we sourced the materials from Hobbycraft and ended up with a big coffin seating chart! We also had a pumpkin on each table and scattered some bat and ouija board confetti around as well as some steampunk keys. Our place cards were little black coffins we sourced from Etsy. We spent an evening assembling them (a lot of glue was involved...) and wrote each guest's name in silver marker and then we filled the coffins with sweets! Worked out pretty well as a place card and favour in one actually. Etsy was a good source also for "Just Married" bunting which we customised in typical Halloween orange and a black pumpkin in the middle. This was in addition to a ghost bunting we had. 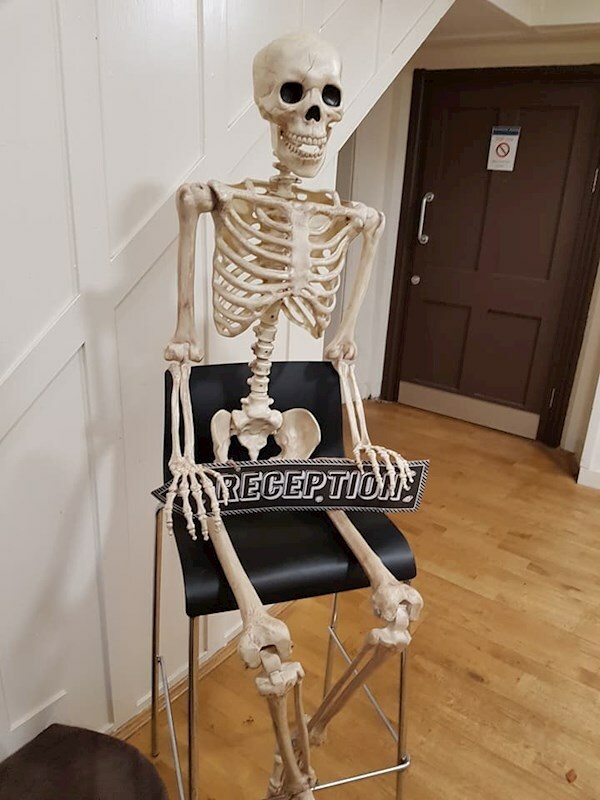 Our house skeleton Bill also came along for the show, he had his own chair by the stairs up to the reception room holding a "Reception" sign. 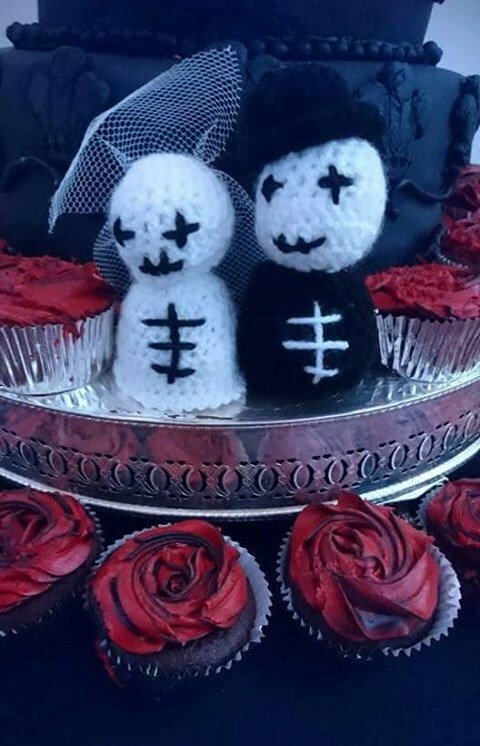 Our cake topper was a little knitted bride and groom that we bought at Horrorcon in Rotherham. A second "topper" was used which was a gift from Drew's uncle's girlfriend (who was also our cake maker). Let's start with Drew, shall we? As mentioned previously, this was never going to be a conventional wedding, which means most of our clothes were custom jobs. Custom New Rock's for Drew in a burgundy/dark red to match Em's dress were ordered pretty early on and looked awesome. Jeans were also customised and ordered from Wornstar in the US. We paid a pretty penny to have them imported but was well worth the cost as they have actually been worn after the wedding, too! 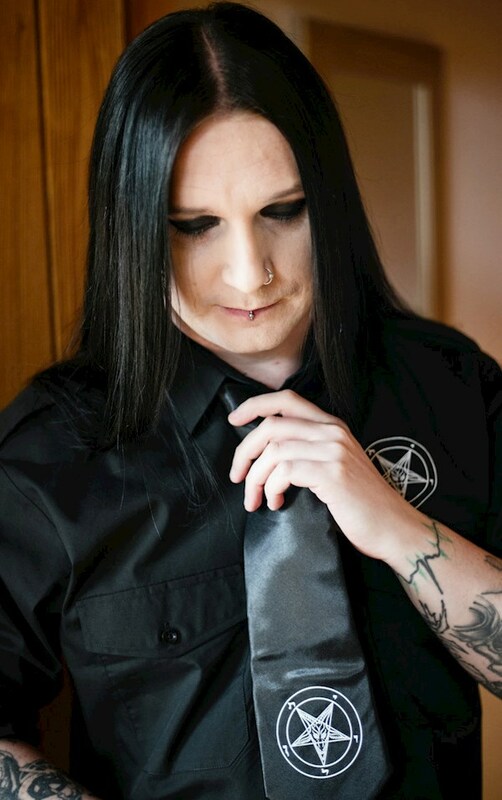 Black long sleeve shirt and black satin tie from ASP Apparel complete with Baphomet logo on both. 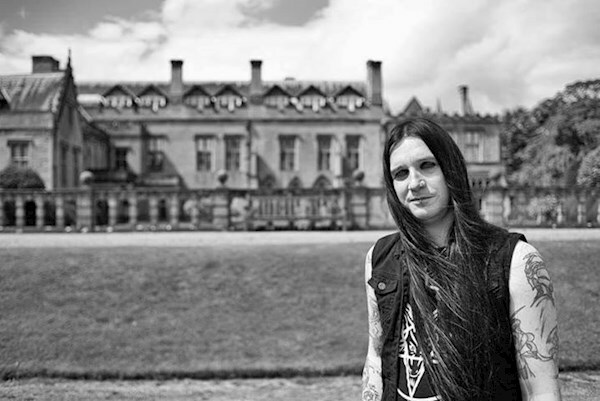 Drew had his heart set on wearing a waist coat similar to one he had seen Wednesday 13 wear in the past. Well, we searched far and wide and could not find the right one... until we realised that we already had a similar looking waist coat in the wardrobe which we had previously bought from EMP! So, off we went and found a tailor called Black Butterfly here in Nottingham and they managed to do a great job of customising it to what Drew was after. To top it off (excuse the pun...) a custom (spot the theme yet?) cowboy hat was ordered from Forgotten Saints LA. One of Drew's trademarks on stage when he was in a band was to wear a cowboy hat so it was only fitting. Let's talk about the Mrs, then. White dresses as far as the internet can see.. that wasn't going to cut it. Em got a few pictures of models of dress she liked, and Googled her way to a dress maker in Nottingham. Off we went to meet with Jema at Kindred Spirits. She knew exactly what Em was trying to convey, and did a quick sketch which was simply perfect. 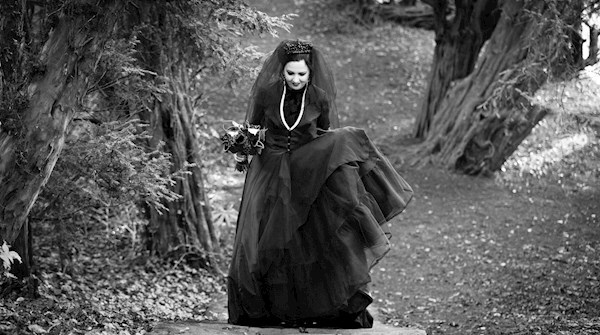 Think gothic high neck, open back, and a big petticoat in tattered layers and to top if off a waist long black veil. Sitting in the studio trying to pick a fabric, Jema remembers that she "has this velvet fabric" that she had been saving. That's it, that was the one and there was no turning back. Not exactly making matters worse that the fabric was a piece left over from costume makers working on the TV series "Ripper Street". It was a match made in.. well, Jema's studio. Jema also made Em's tiara which was a metal wire with red and black beads. Heavy as it was, a perfect compliment to the dress! 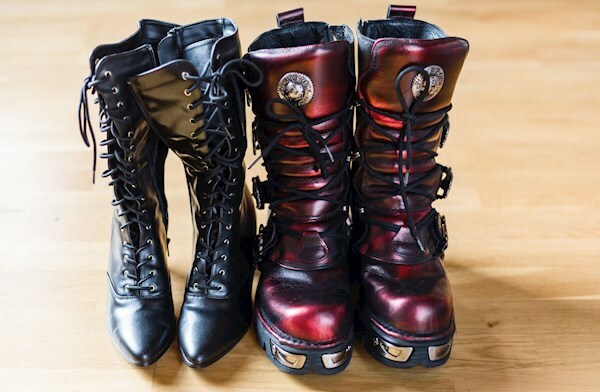 Black victorian style lace-up calf length boots ordered! A black longsleeve jacket ordered too mainly for the arrival, just to not show off the dress too soon! The jacket was a little on the small side, so our friend Sandra (who happens to be educated in the area of dress making) kindly helped to adjust it ready for the big day! 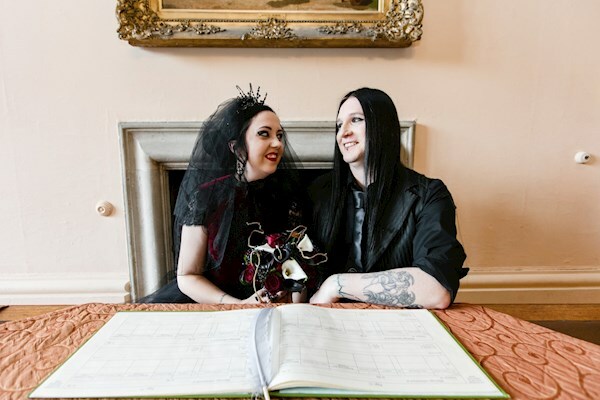 We didn't wear many accessories; Drew had a silver bike chain bracelet, and Em had dangly gothic cross earrings, and hair pins of which one was a ouija board planchette. 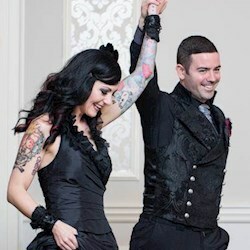 Em also had a black lace garter with a skull sewn into it. One thing we did incorporate was the "Something old..." and we both took part in it. 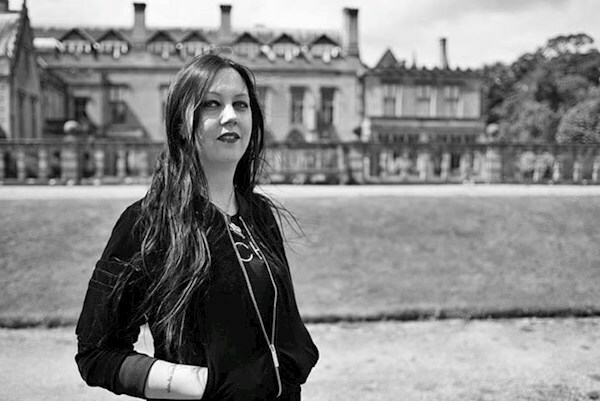 Something old – Em had borrowed her mother's engagement ring for the day. A beautiful band which was worn on the right hand. Something new – basically all of our clothes came into this category! Something borrowed – again, Em's mother's engagement ring. 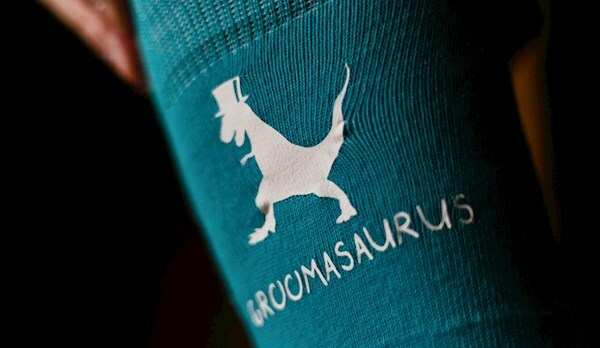 Something blue – Drew wore these blue socks with a T-rex sporting a top hat with the text "Groomasaurus" underneath it. A lot of window shopping in online alternative stores happened, but nothing that really caught my eye. I found so many nice models of white dresses and eventually realised that to get what I really wanted, I would need to find someone to make it for me. So, as mentioned earlier – I found a dress maker here in Nottingham who made my vision come to life. Jema's portfolio speaks for itself and my dress was truly stunning. I could not have been happier with it. From the original meeting and rough sketch through to the fitting, it was such an exciting time! My friend Abyan came with me for the final fitting which was a tad emotional, actually. 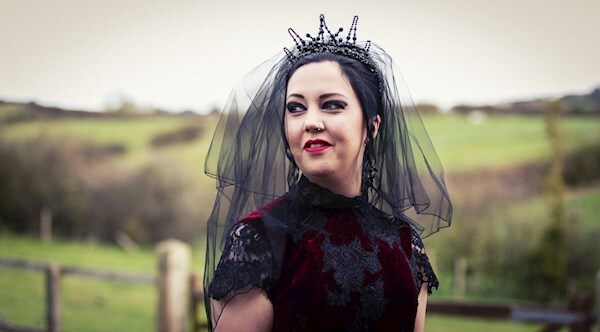 I really felt like a goth princess. 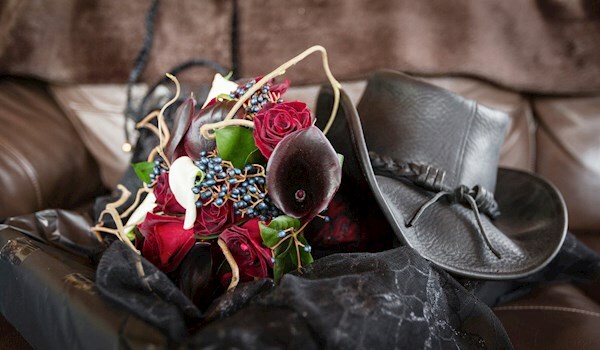 I remember it was raining when we went to collect the dress and we marched through town with these bags and boxes on our way to celebrate with cocktails. On the wedding morning after my hair and make-up was done, I had help to get into the dress (had to climb into the petticoat, and with an open back with tiny buttons at the back it was not something I could do myself!). Once dressed, I just kind of stood and gazed at myself in the mirror for a bit, I genuinely felt like a little girl trying on a pretty dress for the first time. I had so many compliments on the dress too, it truly is a masterpiece in it's own right. That car looks pretty impressive! What can you tell us about that? An interesting story, actually. Em had this guy add her on facebook and he invited her to like a page called "Graveyard Limousines". As we were wedding planning anyway and we hadn't settled on mode of transport this one quickly piqued our interest. 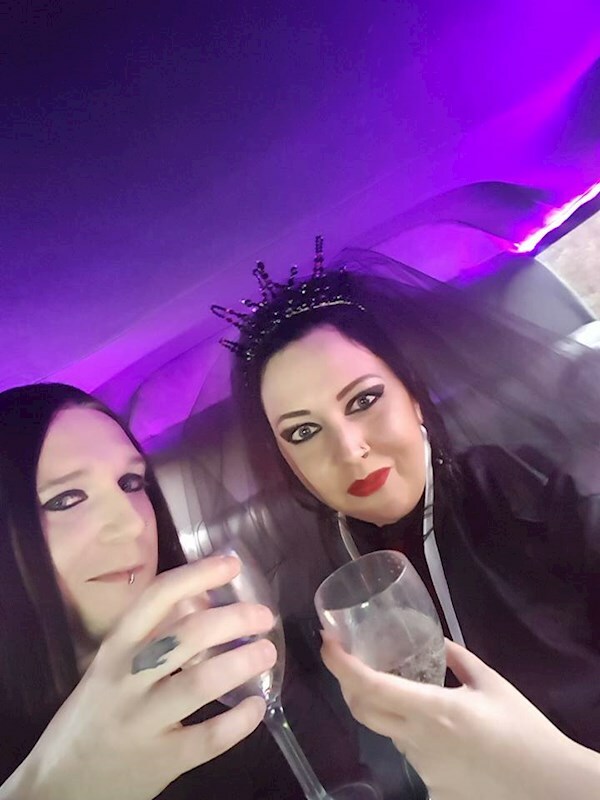 "This guy", Lee, came up to Nottingham for a drink with us after we had been chatting on Facebook for a while, and gave us a free little tour in his small limousine hearse. Well, we were sold. A little concerned how Drew's nan would feel about the whole thing but it was too awesome to pass up! Said and done, booked ourselves in. 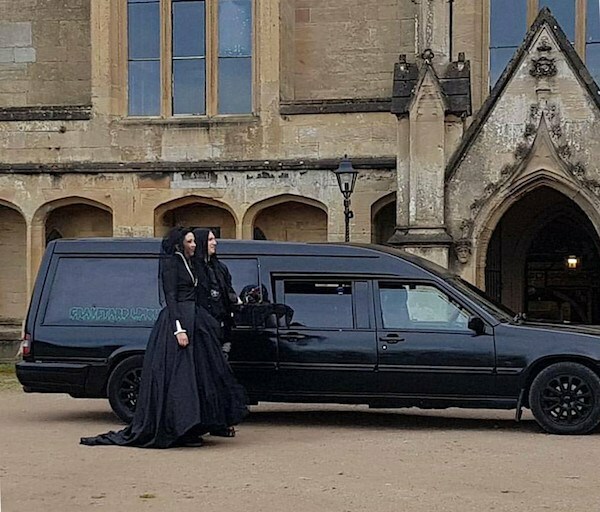 Lee showed up on the wedding morning in this beast of a Volvo limousine hearse complete with classy chauffeur outfit in an awesome goth twist. 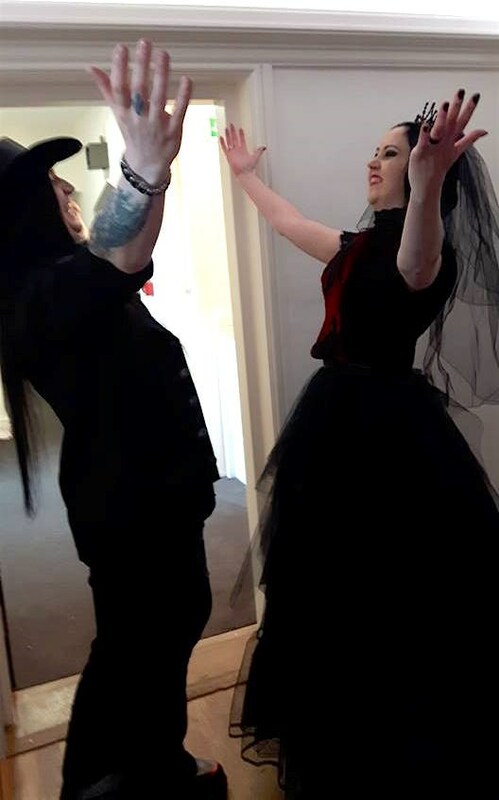 We got into the car (which is easier said than done when one is wearing a huge petticoat) and Lee had prepared this really sweet video for us with pictures of us together which he had sourced from Facebook, all to to the tunes of Murderdolls – Love at First Fright. A very nice and personal touch! Lee also provided us a bottle of wine which we had on the way to the venue. You cannot imagine the sound of this car!! The engine roars like a beast, and the sound system is out of this world. There was a lot of "wooing" happening as we arrived. All in all, what the tagline says – simply "A ride to die for". Lee stayed for the ceremony and welcome drink which was really nice, too. We opted for a civil ceremony. 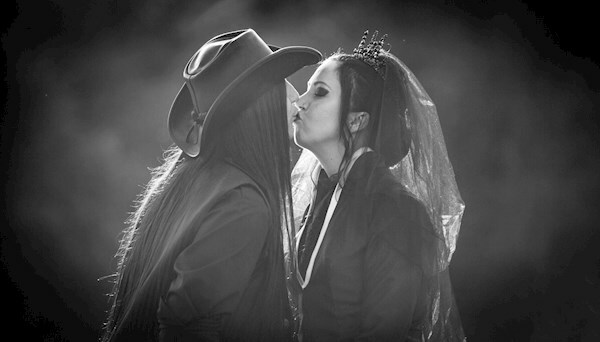 We did toy with the idea of getting a Satanic priest to to do the ceremony but this was not to happen. The civil ceremony suited us quite well, albeit a bit formal in nature. 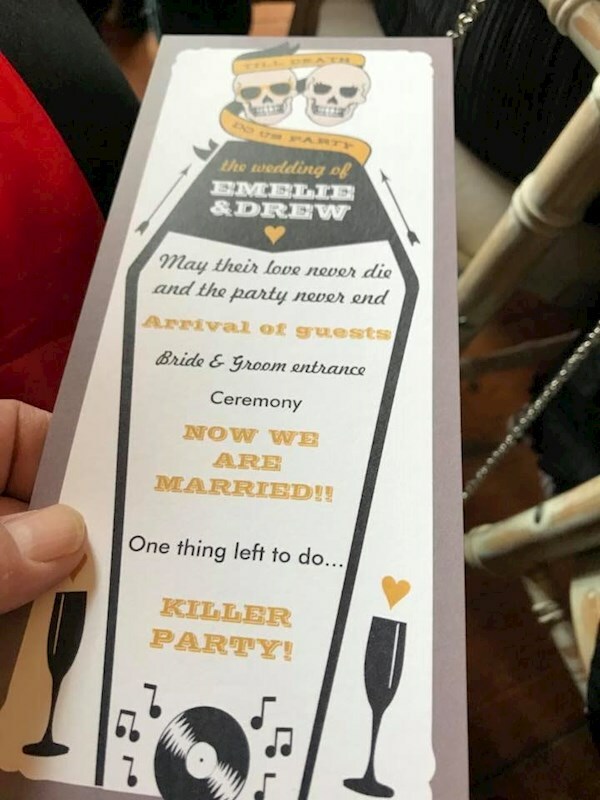 There is a lot of repeating of full names throughout, and as Emelie has 2 middle names it didn't make the ceremony any shorter. We did write our own promises, and Drew pretty much had all the guests in tears after his. Em was keeping it together; purely for the fact that she had to read hers after, so crying wasn't an option, haha. 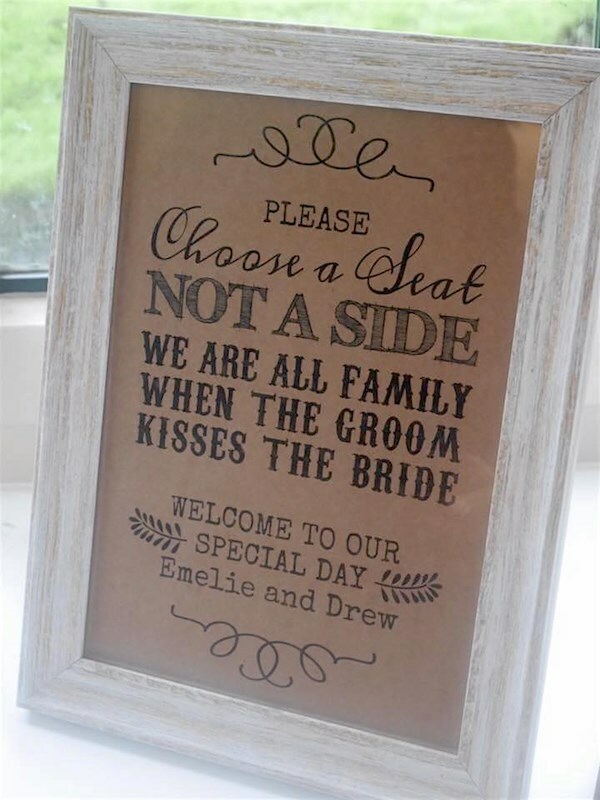 There were no sides at our wedding; we had a sign at the entrance about "choosing a seat not a side", and all chairs were kept together in lines of 7. This made the ceremony more intimate, and instead of walking in "through" the guests and down the aisle, we walked in behind them and around them on the side. We had a solo violinist play for us; Lizzie Barker is her name and we found her on Facebook. We made some requests for songs to be played. For our entrance, she played Pachelbel's "Canon in D"; for the signing of the register she played Ben E. King's "Stand by Me" and the "Jurassic Park theme". For our walk-out she played Wednesday 13's "Death Arise Outro" from the Dixie Dead album. 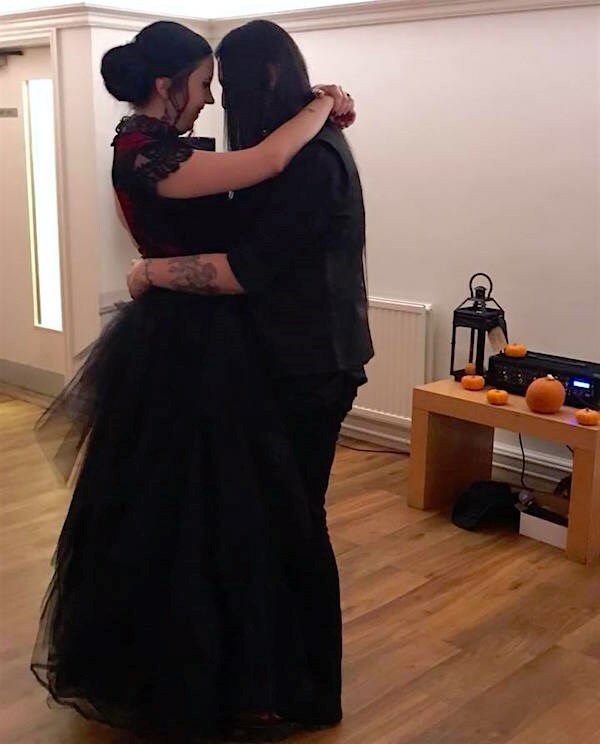 We got engaged in June 2015, and married in October 2017. We basically had the venue booked 2 years before the wedding day which was great in terms of planning. As there are so many more things to think about when planning a wedding than you can ever imagine before you start, it was great to have so much time! We had time to really think about what we wanted; to research clothes, accessories, music, basically everything around the whole day. With all the things and little details you need to think about and decide on (what kind of forks would you like?) it would be easy to think that those would be the most stressful, however we both found that the people invited actually causes more stress! We stated clearly on our invitations that children were not invited as we didn't want to have to think about entertainment for them, yet we had guests asking if they could bring their children. Someone else was a very fussy eater and wouldn't like their food; could they bring sandwiches instead? Those are perhaps the more extreme examples, but even trying to get everyone to RSVP by the due date indicated proved a little difficult! The masks are a nice touch, whose idea was that? Another one of Em's ideas. We're not sure where the idea came from exactly, probably a shower thought in fairness. We ordered masks at a pound a pop on Wish. 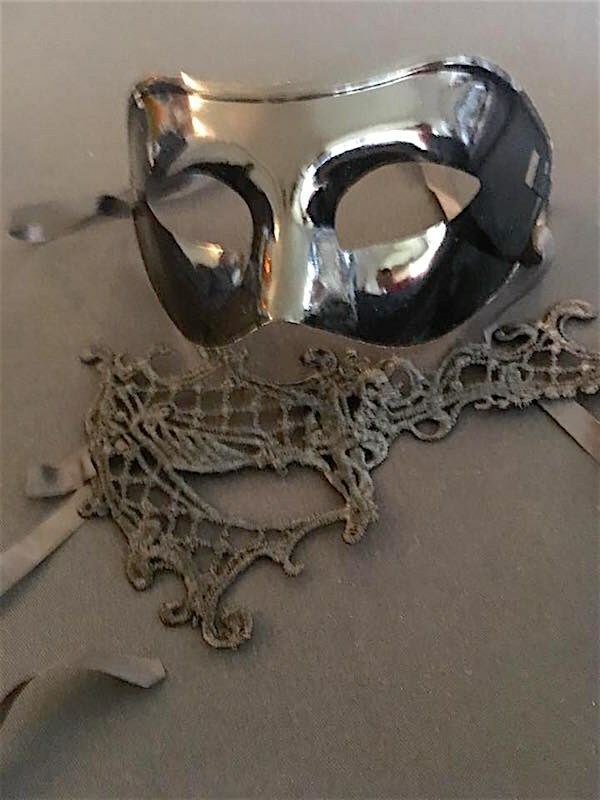 We had a phantom style mask, and a one-eye style mask in lace. Separate masks were ordered just for us; we went with a bat theme. The masks for the guests were handed out as they exited the ceremony room. 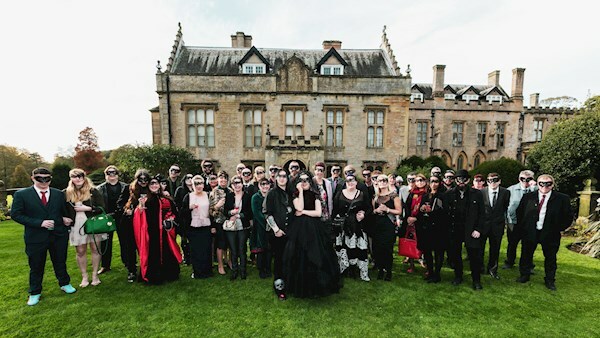 Our photographer managed to get us with all our guests in a photo where everyone is wearing their mask. 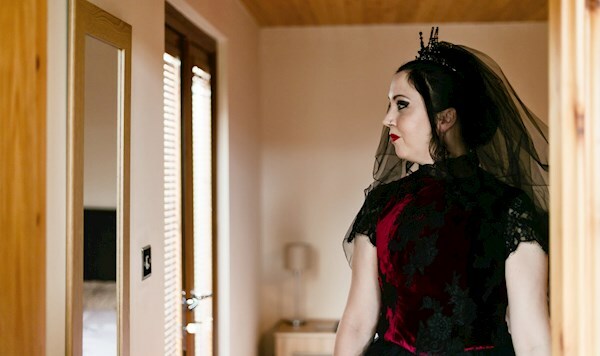 We didn't have a dress code in place, we kind of said to our guests to wear what they feel comfortable in but obviously it was a wedding so people want to look nice. Our guests ranged from close family including grandparents to friends from the "alternative scene" so it was a happy mixture, really. 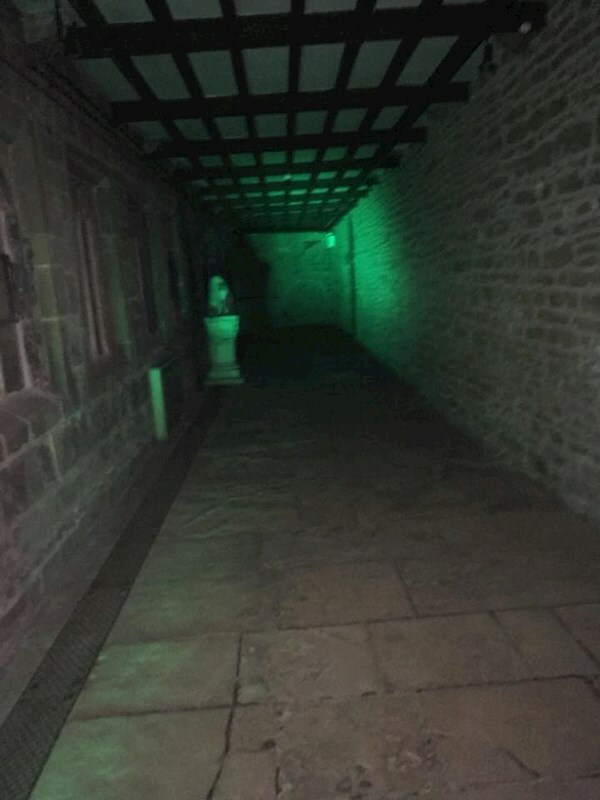 Only four guests didn't join the ghost tour which was a great turnout and a bit of a different thing to add to a wedding. We have had a lot of positive feedback from our guests afterwards and everyone seemed to think it was a pretty amazing day with a very "us" feel to it, which I guess is exactly how it should be! Everyone was very encouraging leading up to the wedding too, constantly reminding us that it is OUR day and we should do what makes us happy. Best advice you can give to a couple about to marry, to be honest. 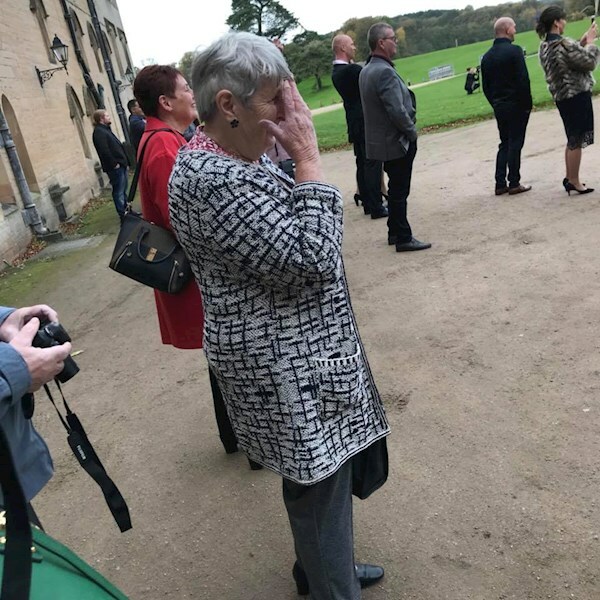 Drew's Nan on seeing the hearse arrive! 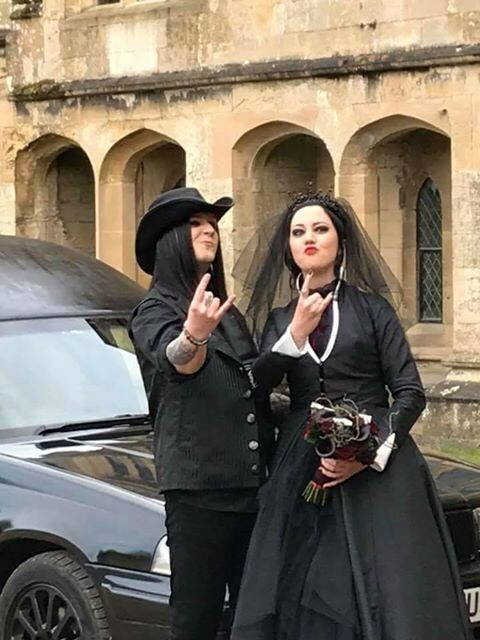 As we both share a love for horrorpunk, and Em grew up with a dad listening to a lot of 50s and 60s music, we found the perfect combination in Blitzkid's "The Torn Prince". An absolute perfect first dance! Funnily enough, we met Argyle Goolsby when we went to see Michael Graves this year and we got talking to him about it. His words were "thank you for making me part of it". That was pretty amazing! Thank you! We are very pleased with them. We actually met our photographer when we went to see Doyle (ex-Misfits) in Chester. We had watched one of the support bands, I Saw The World Burn, and were popping outside afterwards. Em went to the ladies' and when she came back out, Drew was talking to the band as they had made a comment about his beautiful bag (namely, Em's bag..). We got talking about the fact that we were getting married, and they asked us if we had found a photographer. Not really, we said, and were promptly informed that their bass player Don is a photographer. We got talking and he showed us some of his portfolio. They weren't kidding when they told us he was good! The likelihood of finding a professional photographer from the same "scene" as you feels pretty slim. We kept in touch with Don and eventually it was decided that we were going with him. Don was a very calming influence on Drew on the wedding morning, as Drew had a bad case of nerves going on. This is a photographer who puts anyone at ease; we never felt awkward for any photos and it was just cool to be able to chat about 'our' stuff with him too. He was very good to work with in terms of what ideas we had, and very open for non-conventional shots. The turnaround time on getting the photos back was also very quick! We really couldn't recommend Don higher. Do check out his website - you seriously won't regret it. In large, not a thing. However, we did have a bit of a mess with the taxi company we used for our guests. Not so much in getting them there, but to get them home! The drivers couldn't find the venue, or claimed they had collected guests when they hadn't...that kind of thing. The most disappointing thing about it is that Drew ended up on the phone with the taxi drivers for such a large part of the evening that we only actually had three dances together. One was our first dance, the second one was a sing-along to "God is a Lie" (complete with air guitar) by Wednesday 13 and we also had a hoedown to Rednex "Cotton Eye Joe". It's really difficult to pick one favourite part, the whole day was amazing. Having our breakfast together in the morning before our suppliers showed up was a bit nerve wracking. Like "this is it" sort of thing. The ride to the venue where we both had butterflies which only intensified when we saw all the guests waiting for our arrival. The ceremony was so intimate and lovely but jeez, anyone who has seen the wedding video can bear testament to how nervous we actually were. Em's legs were shaking the entire time. The drinks after the ceremony, the pictures with our photographer, the meal and dancing... it was all amazing. 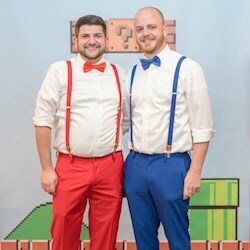 In honesty, if we had to pick one thing only it would be the fact that we managed to make our wedding day truly unique and that everyone we hold near and dear were there to celebrate with us. First of all; do what is right for YOU. Do not let anyone else dictate what you can and cannot, should and should not do. It's YOUR day so have it your way. If help is offered, take it. Keep lists of things to do and things that have been done. We kept a "wedding cabinet" with all wedding related items to ensure it was all in one place for when we went to decorate the venue. Don't panic, it will be fine. Something will probably go wrong, but it will be fine. We (mainly Em) spoke to a few people beforehand and asked them to try to deal with any "mishaps" during the day and not tell us if it wasn't something we absolutely needed to know about. Enjoy the moments, the day will be over so quickly. If all else fails, you will be married at the end of it and let's face it – that's the reason we go through this heap of planning for this one magical day. We've been married for just over six months, and if we could go back and do it again we'd definitely do it in a heartbeat! Thanks to The Don Photography for use of the professional wedding photos. Also, John Hoffman Photography for the engagement photos.